The chap with the gold belt is HRH the Duke of Glouster. The others are RAF/ATC officers and cadets... except of course for me and the bald chap in the bad suit... Air cadets are easier to film than dukes... they don't have bodyguards! This post has nothing to do with Lords, Sugary or otherwise. Since January I've been part of the Skillset Apprenticeship in creative and digital media and working with Pencoed based production company It's My Shout Productions - It's going really well. This is the first time that this scheme has been run, and I really feel that it is the best opportunity that I've had of getting into the industry properly. Below is a press release from Skillset with a photo of all the apprentices. I'm the one with the bright red nose due to a particularly nasty cold that has left me talking like a Dalek! This does not stop me from working on projects like Overdrive, so keep watching for more stuff from me soon! 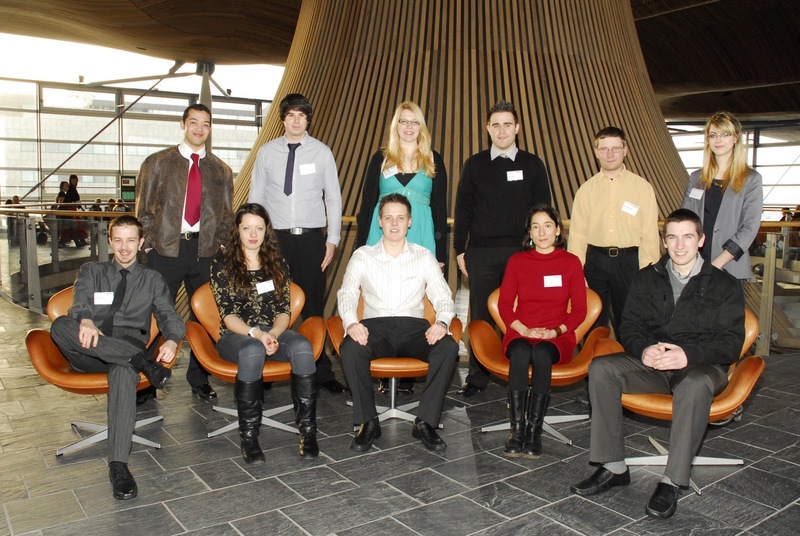 Skillset Cymru held a reception to celebrate the Apprenticeship in Creative and Digital Media at the Senedd this morning (Thursday, 10 February). The event was addressed by Lesley Griffiths AM, the Deputy Minister for Science, Innovation and Skills, and Chair of Skillset Cymru, John Geraint. A selection of apprentices who are working with some ofWales’ biggest media companies also gave their view on this new scheme, which is forging a new direction for apprenticeships in Wales. Lesley Griffiths described the Apprenticeship as an important boost for the Creative Media Industries in Wales and a great opportunity for young people interested in forging careers in this field. “It is particularly pleasing to launch this initiative during Apprenticeship Week Wales when we are promoting the value of apprenticeships for both employers and individuals. The Apprenticeship is a brand new way for young people to find their way into the exciting world of the Creative Media. Roles are available in a range of areas within creative media including Production, Interactive Media, Camerawork, Editing for Sound and Video, Interactive Multi-Media, Web Authoring, Animation and Digital Content. There are currently 11 young people from South Wales taking part in the 11-month programme at some of Wales’ most exciting media companies, including ITV Wales, Ceidiog Cyf and CC4. The Apprenticeship, which leads to a Level 3 Certificate in Creative and Digital iMedia, is also set to be rolled out in North Wales during forthcoming weeks. The Minister also announced that one of the apprentices currently on the programme, Huw Parry, was the 1000th apprentice recruited through the Welsh Assembly Government’s Young Recruits Programme. The Minister visited Huw at his workplace, multimedia production company Telesgop, in Swansea yesterday. The Apprenticeship is part of a project which is supported by the Welsh Assembly Government's Sector Priorities Fund Pilot (SPFP) programme that also receives additional support from the European Social Fund. For more information about the Apprenticeship in Creative and Digital Media, visit: www.skillset.org/walesapprenticeship.